In the heart of the Wild Coast is Coffee Bay, a small inlet near Mthatha with only a grocery store, post office, and a few B&Bs and backpackers to its name. The destination largely appeals to students and the young at heart, and the nightlife consists of drumming circles and the occasional trance parties. 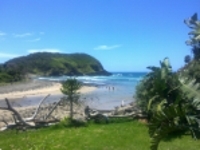 What Coffee Bay does have, however, is some of the best surfing in South Africa, along with spear fishing, scuba diving, and swimming, on an unspoiled stretch of coastline. There is fishing to be done, and you'll likely spot dolphins, whales, and the occasional Cape Clawless Otter. The area is a paradise for hiking, horseback riding, and golf. The Wild Coast is one of those rare places left in the world where you can walk for hours along a beautiful coastline and see not another soul, with wildflowers and natural forests growing down onto the beach. Although distinctive landmarks are few, don't miss the iconic Hole in the Wall, a remarkable rock that has had a giant tunnel carved into it by the sea. A great way to experience the wealth of seafood in the area is to hire a local fisherman, easy to find along the beach if one doesn't approach you, who will bring you his daily catch for a small sum of money.